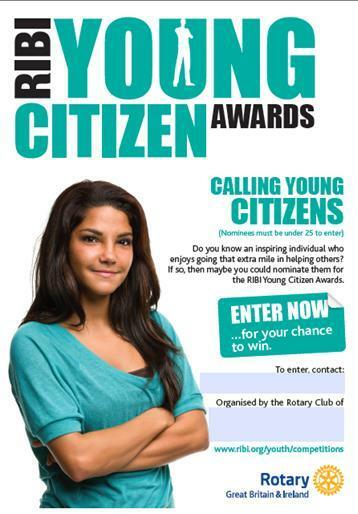 Rotary International in Great Britain & Ireland (RIBI) celebrates the achievements of young people with these annual RIBI Young Citizen Awards. Launched in 2007 in association with the BBC News Channel, the awards recognise young people under the age of 25, who have demonstrated their commitment to citizenship through various activities. The awards can be for individuals or groups, for projects that showcase and celebrate the positive citizenship and important responsibilities assumed by many young people in Great Britain and Ireland. RIBI Young Citizen winners receive trophies and a prize of £500 at the RIBI Annual Conference, where the awards are presented live on the BBC News Channel. Later in the year, the winners visit the BBC News TV studios in London and the Houses of Parliament. Every nomination receives a personalised certificate from RIBI via their local Rotary club recognising the achievement. Contact Shaun Ashworth, Youth Service Chairman by clicking here.